Dodo!. Kowalski, आप want to explain this? And why there's a washing machine in our HQ?. Wallpaper and background images in the पेंग्विन्स ऑफ मॅडगास्कर club tagged: penguins of madagascar kowalski. Wonder what episode this is. HOLY CHEESE AND CRACKERS!! Why is there a Dodo bird in the HQ?! I have GOT to see that episode! Wait, is this the episode from next weekend? penguinlover13: I don't think we know what episode this is from at all, and I sure don't know what episodes are airing next week, but I'd guess probably no. Could be wrong, but I don't think they'd show screenies for an episode they're airing so soon. Maybe this is going to be the "Halloweenies" episode or whatever it was called, it would make sense since Halloween is coming soon.. but why would a dodo bird be in it? ._. Dodo! interesting. is it gonna go psycho and endanger everyone AGAIN kowalski? Now Julien has another bird to make fun of the flightlessness of. 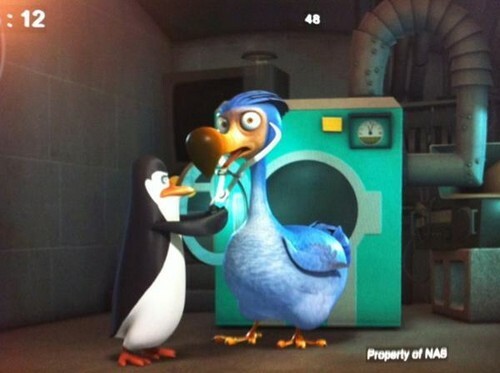 My guess is that Kowalski used whatever green appliance is in the background to bring the extinct dodo back to life. Whether he did it by going back in time, taking a dodo display from a natural history museum, cloning, or some other method I am unsure of. @Bluepenguin: The title "Halloweenies" has been confirmed to be a non-episode. It was what last year's promo with the "penguin-bats" was officially called. ...O_o holy crap. What in the name of returning guest characters? Wow! Good idea Kowalski! I wonder if bringing the dodo back to life will work. Ok, if you want to see the new episodes that are comic soon, go to List of Penguins of Madagascar episodes and click on unaired episodes. It'll show you all the new eps coming soon. I'm missing alot too. But I'm gonna hunt down that Dodo!! I keep looking at it. Good greif it looks weird! The penguins make a new friend in Dode the dodo bird, who they clone back into existence after a pesky bout of extinction. Having grown up with no natural enemies, Dode has no fear and it leads him to daredevilish behavior – the kind that can make you extinct over and over again. The penguins don’t want to see this keep happening to their friend, they need to find a way to slow this crazy bird down! Looks like that's him! On the 16th, at 1:00 PM (that's EST I think) right after Operation: Antarctica! ^That is really what it's about? Cool. Where did you get that, though?